KINGSTON, N.Y. — The hosts went on the front foot early and never looked back. 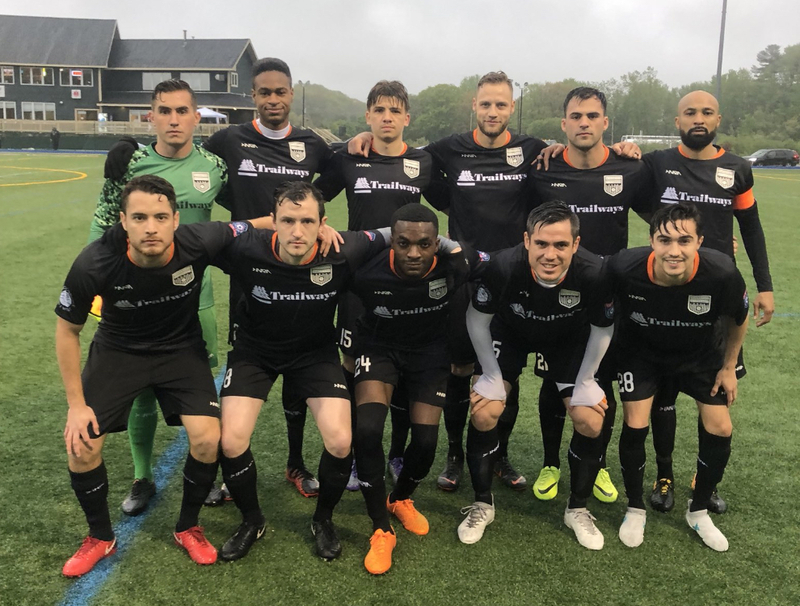 Riding an early goal, and then a second strike before halftime, Kingston Stockade FC topped Seacoast United Mariners, 2-0, on Saturday evening in front of 1,014 supporters at Dietz Stadium. Stockade's Matt Koziol opened the scoring from the penalty spot in the 4th minute, after forward Afonso Pinheiro was taken down in the box by the Seacoast keeper. Alex Tejera then scored off a short corner in the 43rd minute to give a hosts a 2-0 lead that would hold the rest of the way. After the match, Stockade head coach David Lindholm praised his side's focus and demeanor in making the most of the early lead. "(The early goal) was a great start to the match, and it took some pressure off of us, just to have a lead and to be able to play from that position," said Lindholm. "We've had that in the past, but I think tonight was a more defensively solid performance from us throughout. And that was key. So having an early goal and being able to be calm throughout the match was helpful and really important." Lindholm also saw the win as vital to keeping Stockade's playoff hopes alive. "We have a tough stretch coming up," said Lindholm. "We have no easy games, and we have to get a lot of points to get into the playoffs, so it was a key win for us. We knew that winning this match was critical for our chances of getting into the playoffs, and really having a good run to start the rest of the season. So having the support that we did, with a huge crowd, and a lot of energy on the field, we needed that and we got the result. It was great." With the win, Stockade's record is now 2-1-3 on the season (wins-draws-losses). Stockade's next match is at home on Saturday, June 16 at 6PM against the reigning NPSL champions, Elm City Express. KINGSTON, N.Y. — It was a tale of two halves for Kingston Stockade FC on Saturday, but unfortunately for the home side, the final result still led to zero points. Despite spending much of the second half in the visitors' half of the pitch, Stockade fell to New York Athletic Club, 2-1, in front of 881 fans at Dietz Stadium on a lovely June evening. A defensive mishap by the hosts led to the first goal of the match in just the 29th minute, as NYAC's Tom Yorston slotted home a breakaway goal that gave the visitors a 1-0 lead. Yorston then converted again just after halftime in the 47th minute, as he expertly collected a cross before one-timing a volley home to give NYAC a 2-0 lead. Stockade then became the aggressor, however, and forced the action for most of the rest of the match. Alex Tejera headed home a goal in the 57th minute for Kingston, off of an assist from substitute Mikey Lanzetta. Stockade was relentless from that point forward, but unfortunately was unable to convert any of their chances, despite numerous skilled attempts by the likes of Tejera, Bruce Jeter, and more. Kingston midfielder Matt Koziol saw the loss as a difficult one to swallow. "The ball didn't bounce our way," said Koziol. "We hit a couple of posts, and they hit us on a quick counter-attack to score their second. We battled hard, we battled well. It's a tough one to take, because we played pretty well, so it's a tough loss." Koziol saw the absence of some key players, including captain Jamal Lis-Simmons — out due to a questionable red card issued the previous Wednesday against TSF — as a tough hurdle to overcome for the hosts. "We were missing a couple of key guys, a couple of starters that would have helped us and kind of solidified us, but we're deep this year, so even then we should have done a lot better today than we did," said Koziol. 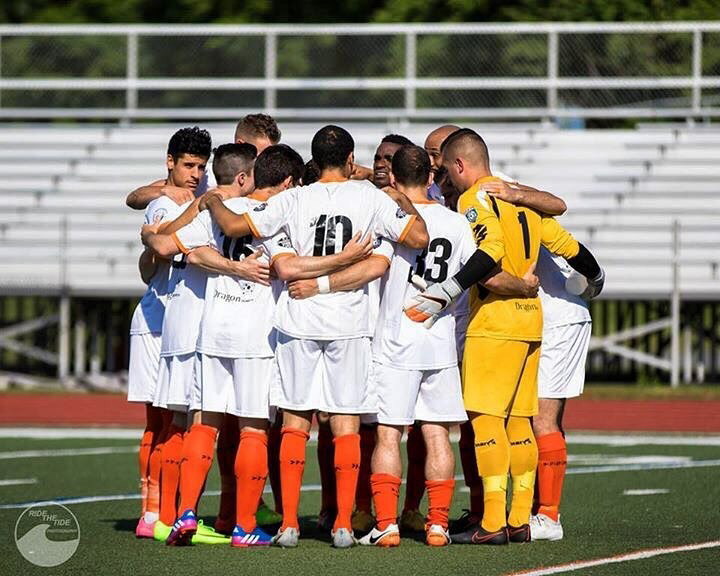 Stockade's next match is at home against Seacoast Mariners on Saturday, June 9 at 6PM at Dietz Stadium. NEW BRITAIN, CONN. — Kingston Stockade FC fell on the road, 3-2, to Hartford City FC on Saturday night in NPSL play. Hartford struck early, as Mark Grant converted a tidy 1-2 at the top of the box to open the scoring for the hosts in the 7th minute. Stockade showed some strong fight-back, however, and countered with a few near misses before Matt Koziol scored the equalizer off a driven ball from Juan Parada in the 38th minute. The teams went into the half with this same 1-1 scoreline. Both teams fought hard coming in the second 45, with Stockade's Michael Corbi nearly scoring in the 57th minute, only to be denied by Hartford keeper Hami Kara. Hartford then took the lead in the 65th minute when Andre Morrison converted a penalty kick for the home side. Hartford's Sebastian Stezeweski did further damage to Stockade's hopes of a road result, by putting the hosts up 3-1 in the 74th minute. Stockade showed some fight-back, however, as Juan Parada converted a penalty kick in the 89th minute. The penalty was earned by Kingston's David Nkansah-Siriboe. 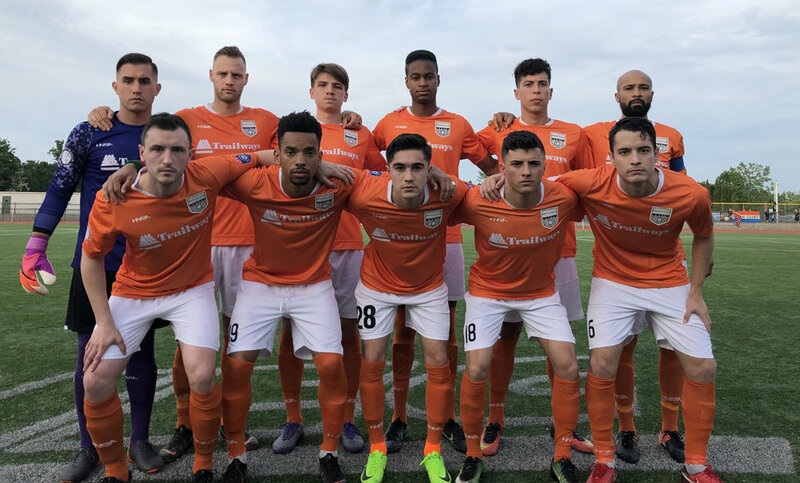 The loss leaves Stockade with a 1-0-2 record (wins-draws-losses) after three matches played in the North Atlantic Conference Division of the NPSL's Northeast Region Conference. Stockade's next match is on Wednesday, May 30 (7PM) at TSF FC. Kingston then plays at home against New York Athletic Club on Saturday, June 2 (6PM). AMESBURY, MASS. — Kingston Stockade FC fell to Greater Lowell FC on the road on Saturday night, 5-1. Jamar Hinds opened the scoring for Greater Lowell in the 10th minute. Jordan Misiri then doubled the hosts' lead in the 27th minute. Stockade got one back in the 37th minute, as Bruce Jeter drove the ball home off of a lofted ball from defender Jamal Lis-Simmons. Lowell made it 3-1 in the 51st minute, as Misiri only added to the visitors' misery by converting his second goal of the night. Cleon Pryce scored in the 61st minute to make it 4-1. Pryce was right again in the 73rd minute, as he completed his brace to make the score 5-1. The match was played at Amesbury Sports Park, and marked the debut of Dennis Crowley Sr. doing play-by-play commentary for the match's live stream. KINGSTON, N.Y. — Kingston Stockade FC rebounded nicely from a rough mid-week domestic cup result to open the 2018 league campaign in style. After suffering a harsh 6-3 result away at Long Island Rough Riders on May 9 in the U.S. Open Cup, Stockade FC bounced back to top Rhode Island Reds, 3-0, at Dietz Stadium on Saturday in the Hudson Valley club's first match of the 2018 NPSL season. Stockade opened the scoring in the 4th minute of the match, as midfielder Matt Koziol shrewdly poked a Juan Gatti corner kick home at the back post to give Kingston a lead they would never relinquish. Shortly thereafter, Koziol doubled Stockade's lead in the 11th minute by converting a penalty kick, which was won by Mike Corbi on the left side of the box. Corbi then did some well-crafted damage of his own in the 18th minute. After Owen Fingar and Michael Creswick combined for some nice interplay to free up the Stockade attacker, Corbi deftly flicked a header over the Reds' defenders before placing a lovely toe poke just inside the far post to give Stockade a 3-0 lead, which would ultimately prove to be the final result on the day. From there, Stockade rode some solid defensive work and composed play up top to find their way to an impressive and relatively comfortable opening win of the 2018 campaign. The official attendance on the day was tabulated at 372 fans. It's worth noting that this figure is people actually making their way through the turnstiles, not the number of tickets sold. Kingston Stockade FC's 2018 home and away kits. KINGSTON, N.Y. — When it comes to the sport of soccer, nothing stokes hope, optimism, and genuine excitement amongst a club's fanbase quite like the release of a new kit. Well, Stockade supporters, it's time to get fired up for season number three. Working closely with soccer apparel manufacturer Inaria, Kingston Stockade FC is proud to unveil brand new home and away kits for the 2018 campaign. For starters, the Hudson Valley side will have an exciting, new look when they take the field for home matches at Dietz Stadium. Stockade will now be wearing bold orange kits rather than the white shirts they've worn for the past two seasons. The up-tempo orange doesn't just speak to the energy and buzz around the club; it is also pays homage to the city of Kingston's rich Dutch heritage. Moreover, the jersey features a sartorial Easter egg of sorts, as it has a subliminated topographical map of the Kingston region, which was added to honor the region from which most of Stockade's fans hail. A map of the area around Dietz Stadium has been added to the 2018 Stockade jerseys. For road matches, Stockade will wear an elegant black strip with orange trim. The away kit also features the topographical shading as well. Overall, both kits were designed to successfully blend a classic footballing ethos with shades of the modern game, and club founder Dennis Crowley thinks the shirts successfully check both boxes. "We're extremely pleased with the look and feel of our new kits," said Crowley. "We wanted to do something that really connected the club to the region — hence, the topographical map — but we also wanted to offer fans something that they'd like to wear away from the stadium as well, and maybe out to the pub or the farmer's market. I think we succeeded on both fronts with these great new Inaria uniforms." As for the kit sponsors in season three, similar to the national growth of Stockade itself, no one has been left behind, but a newcomer has joined the party as well. 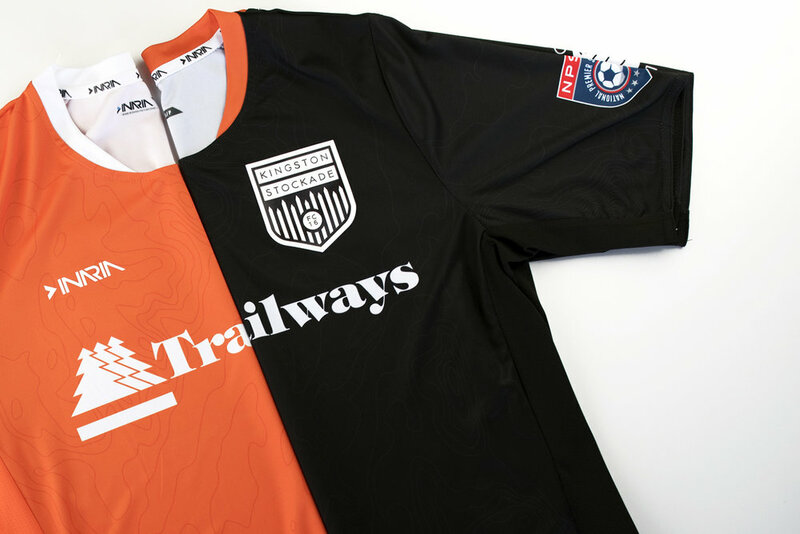 Local, trusted bus company Trailways of NY remains the key front-of-shirt sponsor on both home and away kits. Trailways of NY has been on the front of the shirt for every season the club has been in existence, and Stockade is extremely proud and extremely pleased to have them back on board for the 2018 campaign. Another sponsorship mainstay, local broadcaster Radio Woodstock is on the shoulder of both jerseys once again as well. A presence at all home games, Radio Woodstock has been instrumental in spreading the word about Stockade in the Hudson Valley region. As for the back of the shirt, a brand new addition should lift the perception of the club on a larger scale. Lyft, the fastest-growing rideshare company in the US, joins the Stockade sponsorship team for the 2018 season. Lyft shares many of the core values that Stockade does, making the company a natural fit for the shirts that Stockade will wear in the U.S. Open Cup next week. Lyft’s sterling reputation on a global scale also matches Stockade's ambitions of being a team that resonates through the Hudson Valley and beyond. The home kits will be unveiled during on Saturday, May 5 at 6PM, at the home friendly against Newtown Pride FC. Both home and away kits will go on sale at Stockade's first regular season home match, on Saturday, May 12 at 6PM against Rhode Island Reds. (Click here for the 2018 Kingston Stockade FC schedule.) Both kits will be for sale online mid-summer 2018. Stockade is also proud to announce its sideline sponsors for the 2018 season. Best Western Plus, Kingston, NY: Best Western Plus is the closest hotel to Dietz Stadium in Kingston, and they'll be offering a 20 percent discount to Stockade fans. Please call the hotel at (845) 338-0400 to ask for the discount, or book online via this link. For more information, visit bwpkingston.com. Bread Alone: A returning sponsor that provides the post-game sandwiches that fuel players on both the home and visiting teams. Bread Alone is a family-owned, values-driven bakery that's been baking using organic grains since 1983. Go to breadalone.com for more information. Cabinet Designers - The Kitchen and Bathroom Design Firm: Cabinet Designers in Kingston returns as a second-year sponsor. The firm aims to improve their clients' lives by improving their living spaces. See cabinetdesigners.com for more information. Ryan Roach & Ryan, LLP: Also a second-year sponsor, Ryan, Roche & Ryan is a full service law firm with over 50 years of experience that was founded in Kingston in 1952. Go to ryanroachryan.com for more information. Todd's Salsa: Another second-year sponsor of Stockade. Founded by celebrity meteorologist Todd Simcox out of Bangor, Maine, Simcox started the company using ingredients right out of his own garden. Todd's Salsa is passionate about supporting local communities and is excited to be returning as a Stockade sponsor for 2018. Go to toddssalsa.com for more information. KINGSTON, N.Y. — With the 2018 NPSL season close at hand, Kingston Stockade FC is proud to announce its roster for the upcoming campaign. After a series of tryouts over the winter, second-year coach David Lindholm has settled on the 39 players he will use for both the NPSL season, and the club's first-ever U.S. Open Cup appearance, which begins on May 9 at the Long Island Rough Riders. KINGSTON, N.Y. — If Kingston Stockade FC's inaugural cup campaign is going to have any depth to it, the initial challenge will be to get the better of a squad from Long Island. Kingston Stockade FC found out on Wednesday that they will face the Long Island Rough Riders of the PDL in the first round of the 2018 U.S. Open Cup. The match will take place on Wednesday May 9, in Massapequa, N.Y. While the Rough Riders could be a tough test for the first-timers from the Hudson Valley, Stockade founder Dennis Crowley thinks the club will be ready for the occasion. "Traveling to Long Island will be a tough test for us in our first ever US Open Cup appearance, but our coaches and players have already been hard at work getting ready for the new season," said Crowley. "Between our on-the-field preparations, and what will hopefully be some solid traveling support, we think we will put forth an effort that will make the Hudson Valley proud on May 9." Crowley also said the team will help ship fans out to "Strong Island" for the match. "We are working on putting a fan bus together," said Crowley. "We saw such tremendous support on the road last year, especially in the playoffs, and we'd love to see folks make the trek to Long Island to cheer us on. We hope to release more details soon." The Rough Riders finished 2nd in the Northeast Region of the PDL in 2017. They had an 8-4-2 (wins-draws-losses) record during the regular season, and fell to the Charlotte Eagles in the Eastern Conference Finals in the postseason. Kingston Stockade FC and Long Island Rough Riders are both in the Northeast Region of the 2018 U.S. Open Cup, which also includes the 2017 NPSL champs, Elm City Express, as well as Midwestern powerhouse Detroit City FC. The match will mark the first U.S. Open Cup appearance in Kingston's history. Don't forget to follow us on Instagram, Twitter, and Facebook.